I've been feeding my husband Lulu very healthy food since the beginning of the year. I was thinking he couldn’t take much anymore, so when he came home I decided to give him a reprieve of sorts. I had already steamed some pumpkin that I intended to add to a low cal, healthy canh (Vietnamese soup). As a treat, I took some of the extra diced pumpkin and created dumplings that I deep-fried. My trick for making fluffy fritters is to replace the standard combination of ice water, flour and baking powder with just cold beer and flour. It gives a nice aroma to the appetizer and pairs well with pumpkin. I also garnished the dish with slices of fried chiles for color. Cupcakes are a convenient way to serve dessert when you have a large crowd to entertain, say for Thanksgiving. Instead of making traditional Thanksgiving pies, consider preparing cupcakes flavored with pumpkin and chocolate. 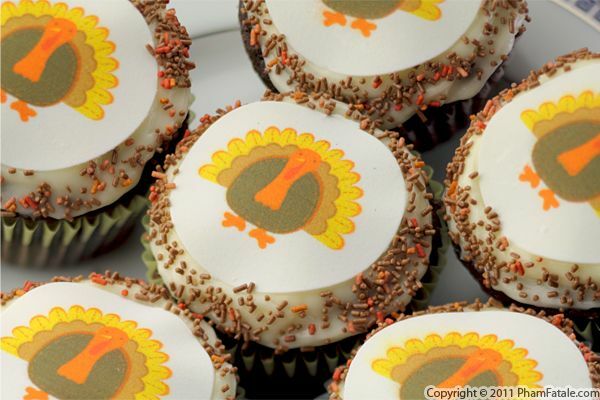 I frosted these cupcakes with pumpkin buttercream and topped them with cute turkey-themed peel-&-press edible frosting stickers. I received the stickers from Ticings®. If you’d like to get your hands on some of their holiday-themed decorations to spruce up your baked goods, check out www.ticings.com. We’ll also be giving away Ticings® decorations, along with more than $1,000-worth of merchandise from other companies to PhamFatale readers during our 25 Days of Giveaways in December. Be sure to check back daily to participate! As I spent my childhood in France, Thanksgiving wasn't part of our traditional feasts. I’ve come to believe that Thanksgiving is synonymous with an abundance of comfort food. My personal all-time favorite comfort food is mac and cheese, so I tried adapting the dish with the flavors of the holiday season. I added diced pumpkin to the traditional layers of macaroni, white sauce and string-y, melted cheese. 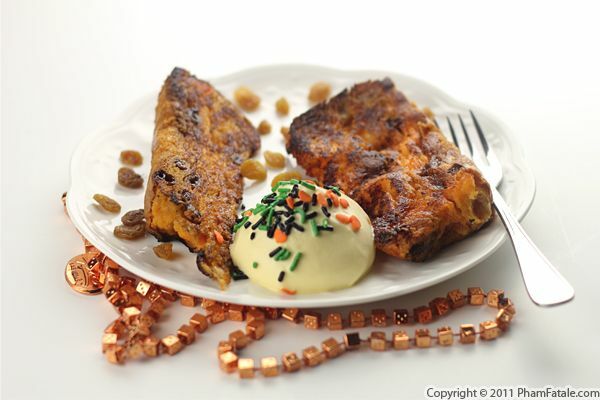 The pumpkin infuses a mild sweetness into the dish and really adds another dimension. It also doesn’t hurt that the colors are so reminiscent of Thanksgiving. Mac and cheese is a great dish that is suitable all year round. You can flavor the dish with your favorite ingredients such as morel mushrooms, red pesto or any combination of cheeses. 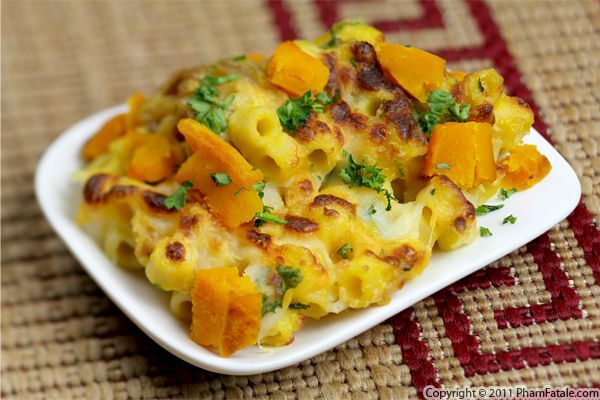 If pumpkin isn’t your thing, make your own pasta gratin creation; let your imagination run wild! It’s that time of the year again! Halloween is over and Thanksgiving is only a few weeks away. The time for fall flavors has definitely arrived. Pumpkin is one of the most versatile ingredients of the season, and today I used it to put a twist on French toast. I prepared a simple custard batter flavored with pumpkin purée and saffron and soaked day-old stale bread. I paired it with a saffron-sweetened heavy whipping cream. The dish is fragrant and flavorful without being overly sweet. It’s definitely a departure from your average pain perdu (literally "stolen bread"). This would be a wonderful treat for Sunday brunch, or for the day after Thanksgiving. I’m making it today for Lulu as a reward for volunteering to take the girls trick-or-treating last night. The girls’ feet started hurting, so he cut the outing short and took them to the supermarket to buy bags of chocolates and candies. That still counts though, right? Whenever we host parties, I always like to serve bite-size appetizers. 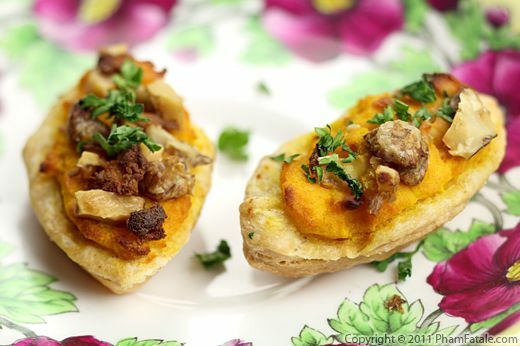 For our most recent fete, I made small savory tartlets filled with mashed pumpkin and Butter Gold potatoes. For extra creaminess, I added crumbled goat cheese along with some sesame-flavored candied walnuts for crunch. The wrapping was made of puff pastry, which I’ve also used for many other types of appetizers. 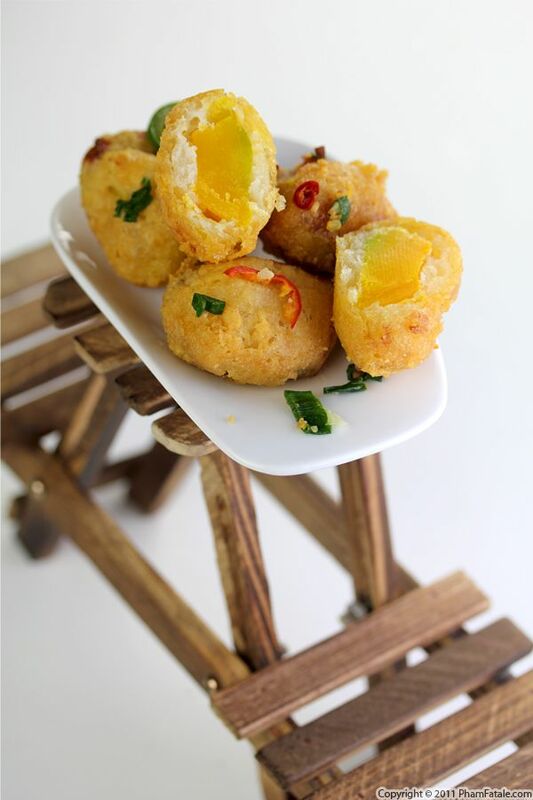 Whatever filling you choose, these cute miniature appetizers are always a hit. Page 4 of 8 pages.